Chief Ron Tischer and members of the La Crosse Police Department would like to thank the volunteers, businesses, and organizations in our community, as well as outside law enforcement agencies, for all of their help in making Oktoberfest 2015 a safe and enjoyable event for all. To help ensure safety throughout the fest, the La Crosse Police Department deployed 55 additional law enforcement officers from agencies throughout the state, including 38 WI State Troopers. These additional officers assisted us in increasing our presence along the parade route and in the downtown and campus areas, as well as answering calls for service with our regular beat patrol officers. Our deployment strategy in the campus area and along the parade route included a mobile presence with Segway, bicycle, and foot patrols, and the campus area command post was also in operation for the fourth year. Our increased availability in the campus area was highly regarded amongst residents, home owners, and businesses, with positive comments of an increased feeling of security and safety throughout the weekend. In the downtown area, the 3rd Street Aid Station returned for the 9th year and proved to be a huge success once again. Numerous people were assisted by the 3rd Street Aid Station staff which included members of the La Crosse Police Department, Tri-State Ambulance, Fortney Companies, La Crosse Area Law Enforcement Chaplains, Subway, and student volunteers from Viterbo, UWL, Western, and Globe University. The most common aid requests included Safe Ride by bus (830) and cell phone charge/phone use (62). To ensure safety along area waterways, the La Crosse Police Water Patrol focused patrol efforts along the Mississippi and Black Rivers between the North and South Side Fest ground areas. Volunteers from Operation River Watch provided expanded coverage to the Riverside Park area and made many contacts. 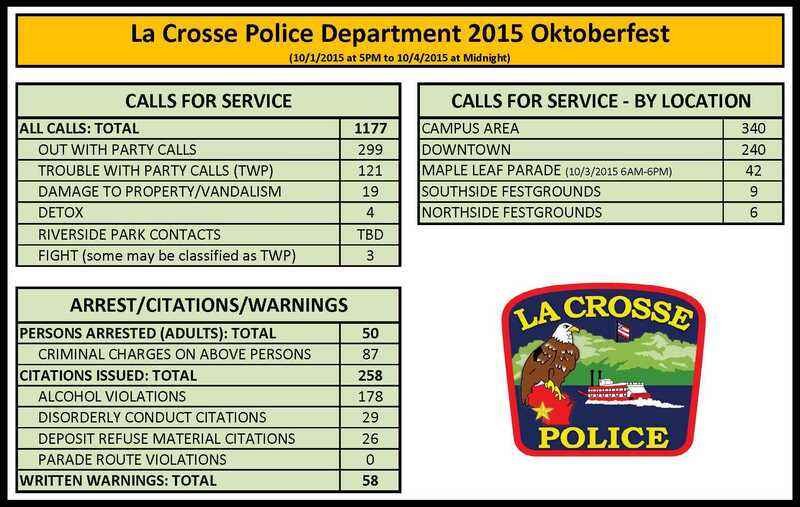 Overall, as with every Oktoberfest event, the La Crosse Police Department was quite busy with calls for service. The data shows that officers responded to 1,177 total calls from Thursday, October 1st at 5PM through Sunday, October 4th at midnight, a significant increase compared to the previous, more typical weekend of 486 calls for service. The most common calls for service resulted in Alcohol Violations, Noise/Loud Party, Suspicious Activity, and Driving/Automobile Complaints. In one serious incident, a La Crosse Officer patrolling the campus area was injured as a result of an unprovoked assault. The officer was intending to provide a student from the University of Wisconsin-Madison with a warning for violation of the city’s open intoxicant ordinance. Upon making verbal contact, the subject pushed the officer. Then when he was being placed under arrest, the suspect assaulted the officer by throwing him to the ground. The subject was subdued by several officers and taken to jail on felony and misdemeanor charges. Follow this link for Oktoberfest 2014 Stats. We look forward to an even more successful, safe, and enjoyable Oktoberfest 2016!